The research we perform wouldn’t be possible without support from physicians within the community – and people like you who want to work to find a cure for cancer. The Cancer Research Collaboration works with doctors, nurses, and researchers across southern California, developing tools to battle cancer and extend the lives of men and women. Clinical research is an essential part of that mission. It’s the process in which new technologies, new medicine, and new treatments are tested and transformed into cures. 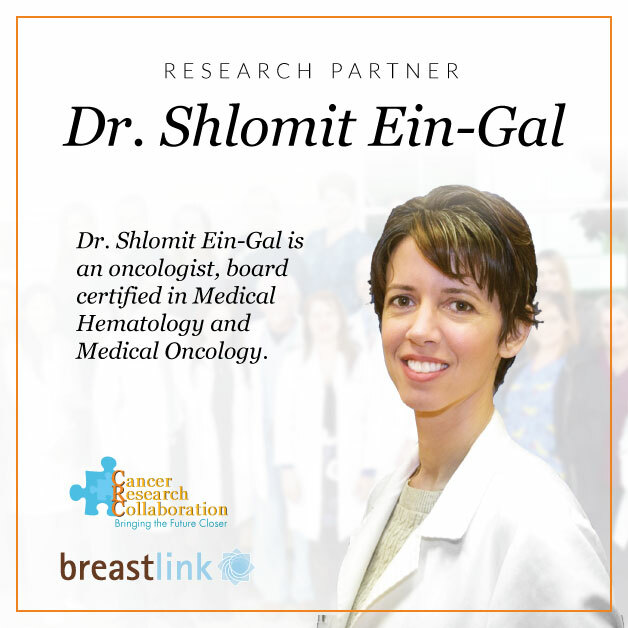 To understand its impact, we spoke with four of our research partners – Dr. John Link, Dr. Shlomit Ein-Gal, Dr. Wade Smith, and Dr. Lisa Curcio – to get an insider’s view of clinical research and its benefits. Why is cancer research so important? How does it improve the effectiveness of cancer therapy? How does it help cancer patients? Cancer research tests new drugs, procedures, and technologies in order to determine whether the new treatments are better than our current treatments. We compare the best technologies and medicine to what we think will be better in a randomized, clinical trial. This process is the reason why we are where we are today. Thanks to it, the cure rate for breast cancer has increased from 55 to close to 85 percent over the past 50 years. What new therapies has the CRC helped develop through its research and partnerships? How has it advanced our knowledge of cancer and cancer treatments? What impact has it had on the lives of cancer patients? Fifty years ago, there was only one treatment for breast cancer: the radical mastectomy. The clinical research we’ve been doing deals with extent of surgery. For years, we have over-treated breast cancer. Our current trials are seeing if we can do less, perform less deforming surgery, remove fewer lymph nodes, and use less radiation. We’re looking for ways to improve the women’s quality of life without sacrificing survival. We’re also developing new tools. Thanks to the Human Genome Project, we’ve been able to sequence cancer and identify genomic signatures in women; genes that predict which women are likely to develop cancer. This allows us to focus on high-risk women and it’s allowed us to reduce the amount of chemotherapy we give women by 40-50 percent, because we can predict who really needs it. We’ve also been able to engineer new drugs that counter genetic mutations in the cancer cells. These mutations make the cells resistant to cancer drugs, but we’ve been able to create targeted drug agents that increase the cure rate. It’s a huge, huge break through. What research do you think will have the greatest impact on the future of cancer therapy and patient care? How do you think it will improve the lives of cancer patients? Right now, we’re involved in an exciting drug trial in using a PDL1 inhibitor. The PDL1 protein is secreted by cancer cells and it tells the body’s immune system that the cancer cells are not harmful. The inhibitor restrains that protein and causes the immune system to attack the cancer. This approach has been extremely successful in melanoma and a type of lung cancer, and there’s evidence that it can be just as successful against breast cancer. I think that this type of research particularly, where we harness the power of one’s own body and immune system, is some of the most important research going on right now. What can cancer patients and their supporters do to help cancer research and the work the Cancer Research Collaboration is doing? We have 12 different protocols testing new agents and we think the contribution this research will make to the greater good is very important. We encourage our patients to participate in these protocols because by doing so they help themselves and help womankind. We appreciate any support to our foundation, financial or in kind, because clinical research is expensive we need the support from the community to continue it, and to be able to go after bigger projects and initiatives. All of the major advances in breast cancer care over the past three or four decades have been due to research. Without it, there would have been no improvements in breast cancer care. It’s very critical. It’s what allows us to take cancer care to the next level as technology advances and as our surgical procedures advance. The IORT (Inter-Operative Radiation Therapy) trial, which is delivers a single dose of radiation to patients during a lumpectomy. Normally patients have to suffer through a long, arduous course of radiation therapy, and not everyone has access to it. Our older patients have difficulty getting to the radiation doctors. It’s still not considered the standard of care, but it’s certainly becoming more and more accepted in a lot of circles. I feel like the CRC was very forward thinking, getting involved in that trial early on. The trial I’m a primary investigator on is the cryoablation trial, which freezes breast cancers. It’s nonsurgical and focused on certain “very good personality” breast cancers. It freezes them to temperatures of minus 120°F, essentially killing the tumors. We’ve been doing it for years on benign tumors. Our current work is based on a prior trial that froze a tumor, took it out six weeks later, and found that the cancer was 100 percent killed. That trial was conducted on tumors one centimeter or less. Now we’re doing a trial on patients with tumors up to 1.5 centimeters, pushing the limits on larger “good personality” tumors. Between Breastlink supporting me by getting the cryo machine and the CRC getting involved, we were probably the first center that was completely enrolled. It’s hard to know what particular research is going to have the greatest impact. We all knew genetics was going to be the big, but we didn’t know how it would affect breast cancer patients. Genomic profiling of tumors has helped determine what cancers need aggressive treatment and what cancers need hardly any treatment, other than surgery. That’s important, but who knows? Some other technology might end up being the next breakthrough. Looking at what we have available right now, genomic profiling of tumors and circulating tumor DNA is the most exciting. In patients who are at increased risk of aggressive tumors, circulating tumor DNA can help us detect when their cancer is going to recur, even before there’s a large volume of cancer cells. This technique could potentially make that distant disease a salvageable situation. Most people who get diagnosed with metastatic disease are not curable, but if you can diagnose the cancer before you can actually see it, with a blood test, you can treat the patient before it becomes a tumor. I think that we can say that we can cure all cancers, as long as they’re not presented to us as advanced, large volume, stage 4 diseases. That’s exciting. Right now, we’re just starting to use it. As we see it trending up, we’ll do imaging more frequently and treating patients when there is imaging evidence, though in the future, we may be able to treat with no radiologic evidence and cure the patient. Chemo is most effective when the volume of the tumor it has to kill is low. What can people do to help cancer research and the work the Cancer Research Collaboration is doing? Obviously, the second biggest pioneers are the people who financially support cancer research, because it’s not cheap. It’s very expensive, and to do good research takes a village. It really takes a huge community. I came from private practice, where I wasn’t able to do much cancer research because I didn’t have the network. I didn’t have the support system. Looking at the support system we have with the CRC, the research assistance they provide, and all the work they do to enroll patients, I know there’s no way I could do this without them. We do need financial support for ongoing research. Lastly, the physicians and researchers who drive the research and are vested to make care better are critical as well. Their work keeps cancer research moving forward. We can’t accept something that we’ve done for 20 years. We have to keep looking at new ways to treat cancer. Cancer research serves a dual role. It helps advance the science of detecting and treating and it offers patients access to experimental medicines with proven benefits, demonstrated in earlier phase studies. For patients whose cancer has progressed beyond commercially available s therapies, clinical trials provide investigational treatment options that may enhance their quality of life or even extend their life expectancy. One example is the anti-HER2 directed antibody therapy, which is used to treat HER2-positive breast cancers. It’s been heralded as one of the greatest breast cancer treatment breakthroughs in the last 50 years. 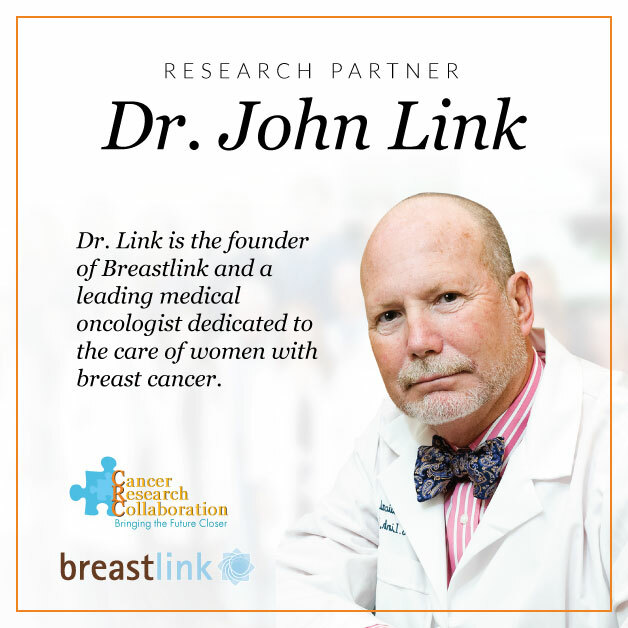 Breastlink, through the Cancer Research Collaboration, has helped to determine how these treatments should be used. Historically, less than a fifth of breast cancer patients with stage 4 disease lived beyond five years of their surgery. Now, more patients with advanced disease are reaching the five-year mark with little or no observable disease on their follow-up body scans. This is a very exciting time to be participating in breast cancer research. Research that enhances the body’s immune response to cancer cells has attracted much attention during the past 2 years. Specifically, immune checkpoint inhibitor therapy has shown great promise in treating advanced “triple negative” breast cancer (cancer cells that lack estrogen receptors, progesterone receptors, and HER2 over-expression). We’re now enrolling patients with this aggressive subtype of breast cancer, whose cancer has spread to other areas of the body, in these clinical trials. Donations are certainly welcome. 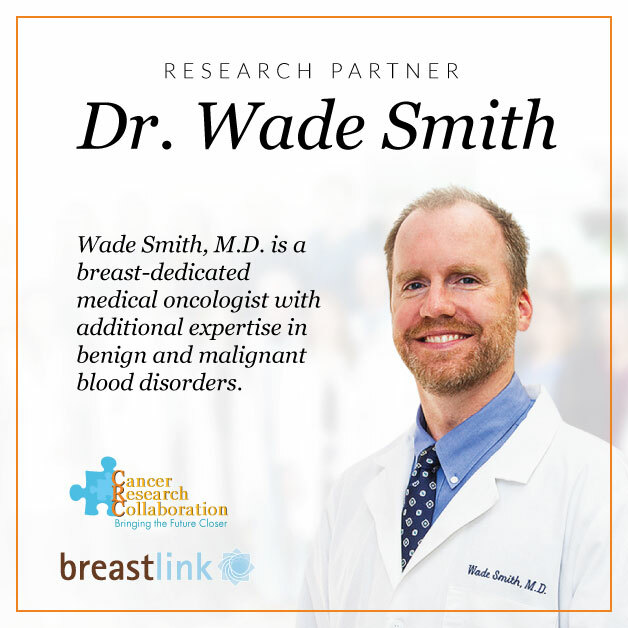 In addition to participating in existing, large cooperative studies, Breastlink also initiates our own research projects in partnership with other organizations, institutions, and private entities. Personal contributions are highly valuable in moving these projects forward. Cancer research helps patients by advancing the field of cancer treatment. The reason breast cancer cure rates are rising is thanks to years and years of research that has yielded significant improvement in detection, diagnosis, and treatment. The CRC is committed to developing new therapies to benefit women with breast cancer. For example, we are in the midst of writing a new protocol for women with triple negative breast cancer, which will help us understand what the best monitoring modality is. High quality research is expensive and any donations to this noble cause is worthy!